For a relatively tiny continent, Europe has an abundance of divisions. Ethnicity, religion, weather, and even food have divided Europe along common fault lines throughout its history. The chart below, taken from Yanko Tsveltkov’s Atlas of Prejudice 2, is a satirically over-broad depiction of some of the most salient of divisions. It is meant to be overly simplified to the point of absurdity, poking fun at those who hold such blunt prejudices about large swaths of territory, so please do not take offense. For many of these maps, however, there is a kernel of truth. My mother’s ancestors hail from Greece, and my father’s from England, which are two countries which could not be more diametrically opposed within Europe. Indeed, in the chart below, Greece and England are on different sides in 19 of the 20 maps. From my personal life, I can attest that these divisions are based partly in fact. Greeks, on the whole, are much louder in conversation than Englishmen, and when walking down the street in Athens, one can be forgiven for assuming that two people screaming at each other are locked in a heated argument when in fact they are just saying hello. As for butter vs. olive oil, I do think the English enjoy cooking with butter and, especially, buttering their bread with dinner, while Greek restaurants often do not even provide butter, and people simply mop up the bread in the juices of whatever they were eating (which inevitably has some olive oil in it). Take the prejudice maps with a grain of salt, because obviously not everyone living within these zones hold the characteristics of those around them. But it is fun sometimes to look at what people in one zone think of people in the other, if only to confront our differences and seek to better understand each other. For more on the Atlas of Prejudice, check out Tsvetkov’s website, and you can order the Atlas on Amazon as well. Tomorrow marks the one year anniversary of my blog! So put on a party hat and join me in looking back on the past year. It was a year full of posts about maps, writing, history, videogames, fiction, and everything in between. We’ve had 84 posts and 125 comments in total, but the most stunning statistic of all is 21,413 pageviews, 17,455 of which have been generated in the past 6 months. There has been pretty rapid growth in readership in the blog recently, but if you look at the statistics, it’s clear that the most significant factor in the increase in the blog’s popularity came from one source: The Hunger Games. I didn’t anticipate how much my post on the map of Panem from the Hunger Games would dominate all other posts, with 8,461 total pageviews, which is over a third of the total pageviews. By comparison, the next most popular post has just 574 pageviews. I could also see that a major source of referral traffic was the google search for “map of panem”, and at one time, my blog was the top result for that search term (though I checked it just now, and it has fallen to the second page). This goes to show what a massively popular book and movie franchise The Hunger Games is, such that the release of a new movie in the series, Catching Fire, could galvanize thousands of people to search for the map for the dystopian world of Panem. And now, here are the top 15 most viewed posts (apart from the Home Page) from the past year, with “Mapping Panem” sitting at the top. Along with The Hunger Games, videogames were a huge driver of web traffic. 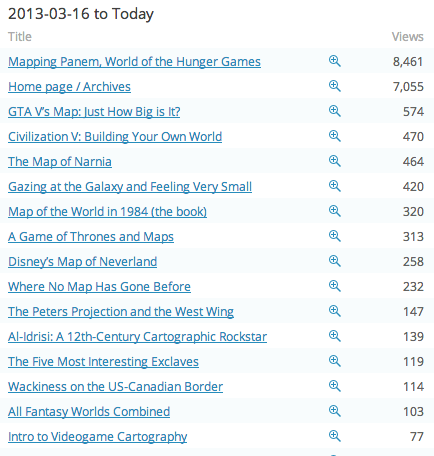 The maps from Grand Theft Auto V, Civilization V, and to a lesser extent, Super Mario World, were all popular posts. 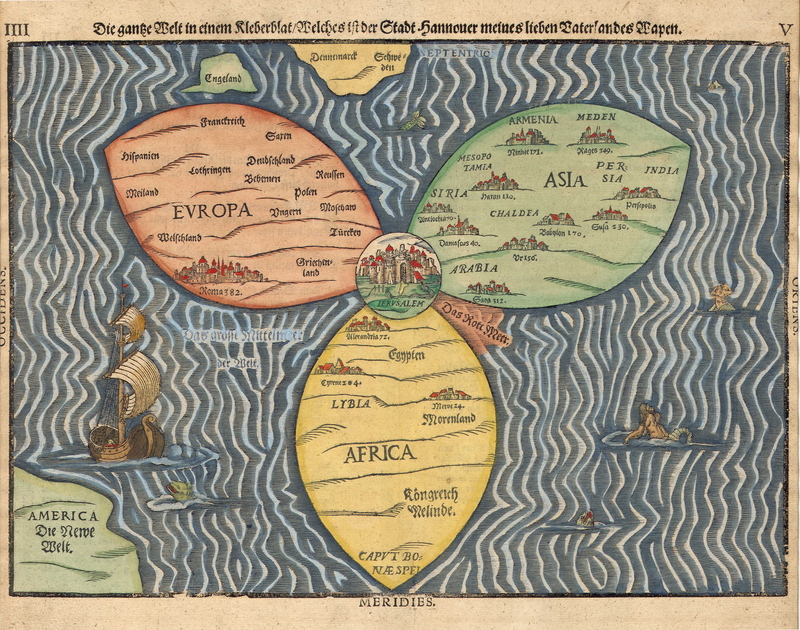 Beyond this, maps from works of fiction also attracted many readers, as maps from Narnia, 1984, Game of Thrones, and Neverland were all in the top ten. But readers also enjoyed reading about historical curiosities as well, such as border irregularities and the world map of Al-Idrisi from the 12th century. Astronomy was appealing too, with popular posts pertaining to the world of Star Trek and the stars in the Milky Way galaxy. One of the major themes of the blog, writing fiction, has become less prominent over time, and none of the posts pertaining to writing ended up in the top fifteen. I’m happy, though, with the shift towards cartography, because it is such a rich area for discussion and attracts interest from a diverse range of readers. The danger with writing about writing is attracting only other writers, when I also want to be bringing in potential readers, those who are intrigued by the subject matter of my book but not particularly by the craft of writing itself. Speaking of my book, The Map of Daggers, the pace has slowed but progress continues. I’ve now written over 64,000 words, or 221 pages. Plot-wise, I’d say I’m about 3/4 through the book. But I know that once this draft is complete, it will be the beginning of the long process of editing and revision. I’m trying to pick up the pace, but it is more important to let it flow organically than create a rushed product. Hopefully by the end of year, the novel will be complete and ready to be enjoyed by fans of fantasy and cartography alike. Stay tuned for updates. And, as always, happy mapping! Prerequisites for Writing Good Fiction? Theoretically, there are no actual prerequisites for writing fiction. It’s not like practicing law, which requires three grueling years of school and passing the bar exam. Anyone with a brain, a pen, and paper, is physically capable of writing. And many people do want to write. But few do. Even fewer get published, and fewer still become best-selling authors. So the question is: How does a wannabe writer become a bona fide one? Are there certain “soft” prerequisites (not required, but greatly advantageous) which someone should achieve before they create compelling, popular fiction? We like to think that absolutely anyone can sit down and write a best-seller, holding up examples like J.K. Rowling, who was subsisting on welfare when she began scribbling the first Harry Potter book on a napkin. But when you look at the majority of the books on the best-seller lists, examples of industry outsiders who score literary success are few and far between. My thinking on this began when I read a recent article by Sonia Saraiya at AV Club, titled “The Bleak State of American Fiction.” In it, she reviews a new collection of essays edited by Chad Harbach titled MFA vs. NYC. The review, as well as the hundreds of comments, are well worth a read, providing an eye-opening look into the publishing industry. One gets the impression from the book review that the publishing world can be somewhat insular, with a pipeline of MFA students becoming professors or publishers, writing books that only future MFA students read. I began to wonder while reading the article: What actually makes a good writer? As a lawyer needs a law degree, does a literary writer need an MFA? Does she need connections with the publishing industry? Should she live in New York City and mingle with other writers at cocktail parties? Or is the path to publishing (hopefully) more flexible and open than this? MFA Vs. NYC details how the “program era,” as is called the period of time since World War II when creative-writing programs have flourished in the U.S., is a culturally mediated institution, borne from Cold War politics and what Elif Batuman describes as the shame of the American writer. It is a sharp critique, and a well-earned one—MFA programs seem to produce fiction that is less and less relevant to the lives of everyday Americans, even as their ranks swell with more and more aspiring writers. I found this assessment especially interesting since I am not very familiar with MFA programs in general. It would seem to me that good fiction should be relevant to the lives of a broad range of people, not just other writers. Literature which is creative and truly novel should draw on different life experiences and areas of expertise. If publishers rely too heavily on the MFA pipeline, they consign themselves to a rather narrow band of human beings: those with the time, money, and inclination to pursue an MFA. Bear in mind that some of the greatest authors in history had non-literary careers before getting published. 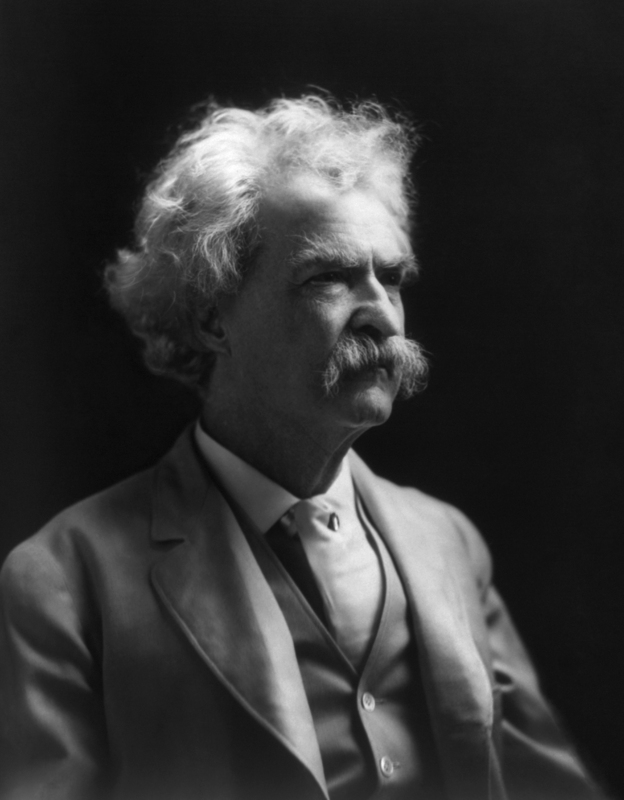 One of my own personal favorite authors is Mark Twain (I’ve been to his house three times! ), and he worked on a steamboat, among other places, in his early years. John Grisham, author of countless legal thrillers, was a lawyer before he started writing. This is especially encouraging for me, as a lawyer who wants to publish fiction. However, my area of legal practice (estate and tax planning) is quite possibly the least exciting subject for a novel. Anyway, what I have come to realize is that more important to the craft of successful fiction writing is actual lived experience, rather than a series of intensive workshops with other aspiring writers or a degree on the wall. Get out in the world and try new things. Travel. Join groups. Volunteer. Above all, meet people. Colorful characters in fiction are born from interactions with colorful real life people. Call me risk-averse or whatever (I’ll gladly accept the label), but I also believe that it just makes practical sense to hold down a day job while working on getting published. And probably even after getting published. One of the essays in MFA vs. NYC, which has already gone viral, is about a woman who received a $200,000 advance for her first novel, which did not sell very well, and she ended up spending it all and going into bankruptcy because she only worked part-time as a yoga instructor. The lesson here is that it is exceedingly difficult to actually make a living as a writer, and unless you are comfortable with a high amount of risk, don’t quit your day job (at least until you’re making J.K. Rowling amounts of money). Writing is an activity that can be done entirely on your own time. Flannery O’Connor one said, “Nothing needs to happen to a writer’s life after they are 20. By then they’ve experienced more than enough to last their creative life.” I would extend that age to 30. Finish your education and start a career. Move in some unexpected directions. Live on your own and rely on yourself. Once you ground yourself and begin to struggle with how to order your life, then you will gain the perspective you need to write truly compelling fiction. The prerequisite is your life. Go live it.